Malcolm Yarnell: The Personal and Academic History Behind the New Book, "Royal Priesthood in the English Reformation"
The Personal and Academic History Behind the New Book, "Royal Priesthood in the English Reformation"
When I was a Master of Divinity (with Biblical Languages) student at Southwestern Baptist Theological Seminary (1987-1991), the prominent issue facing Southern Baptists was the conservative resurgence. After examining the various issues, theological and political, consulting with mentors, pastoral and academic, and spending time in prayer, personal and corporate, it became clear to me that the conservative movement was fundamentally correct in its primary theological claim regarding inerrancy even as some of the political actions made on all sides were less than acceptable Christian behavior. However, the doctrine of Scripture's "inerrancy" or "dependability" (to use the term favored by James Leo Garrett, Jr.) was only one of a number of important doctrines that came under reexamination during this turbulent period of Baptist life. Another doctrine that arose in importance was variously known as "the priesthood of all believers" or "universal priesthood," among historical theologians, or as "the priesthood of the believer" or "the believer-priest," in its more solipsistic rendition. While visiting in the hallway after one of his marathon Systematic Theology lectures with the aforementioned professor, I expressed my desire to pursue further academic studies. Dr. Garrett queried me regarding my exact interests and I noted the Scripture's teaching about a "royal priesthood" as well as my concern that this universal priesthood was often unfortunately correlated with a culturally-conditioned Western individualism. I can still see the look in his eye as he encouraged me to pursue such research from both a biblical-theological and an historical-theological perspective. (Dr. Garrett had already written quite a bit on the subject doctrine and we are currently collaborating on a long essay on the doctrine in its relation to congregationalism.) The Lord has used that gracious hallway conversation with one who has been called "the dean of Southern Baptist theologians" to shape my whole life. After completing the MDivBL at Southwestern, I was called by the Lord to enter the pastoral ministry, specifically in order to be prepared to equip future seminary students better. (After all, the best teacher is one who has been where his student is going. Leading churches for six years in Texas, Louisiana, and North Carolina also gave me a passion for preaching the Word and a profound sense of responsibility to the local churches that I hope I never lose in the classroom.) During my pastoral sojourn through North Carolina, I matriculated at Duke University, where I wrote a Master of Theology thesis on "The Reformation Development of the Priesthood of All Believers" under the supervision of the accomplished historical theologian, David C. Steinmetz. During an exploratory journey, after a long teaching tour through the recently opened nation of Russia, I interviewed with Diarmaid MacCulloch of the Theology Faculty at Oxford University and with Larry Kreitzer at Regent's Park College, the Baptist school attached as a Permanent Private Hall to the University. There were sure indications from the Lord in so many ways to attend Oxford for three years of study and my wife and I still look back on that experience as some of the best years in our lives. To begin with, I was supervised by Kenneth Wilson, Principal of Westminster College and a Methodist philosophical theologian, who led me to study the broad historiographical, philosophical, and theological issues undergirding the development of the doctrine of royal priesthood. When I opted to narrow my studies to the English Reformation, the faculty assigned Judith Maltby, Chaplain at Corpus Christi College and an Anglican historical theologian, to be my supervisor. Judith introduced me to the intricacies of the English Reformation and proved to be an incredibly insightful reader and commentator on whatever I wrote and submitted to her keen eye. Rowan Williams (yes, the now retired Archbishop of Canterbury) and Diarmaid MacCulloch (yes, the famous historical author and British television personality) were, respectively, the external and internal readers for my dissertation. It was intimidating to enter the faculty offices and meet both men, who were dressed in their full regalia, in order to be queried for three hours regarding my thesis. But, at the end, they lauded my work and, furthermore, recommended that the dissertation be awarded publication by Oxford University Press. This was a rare and unparalleled affirmation and opportunity. Oxford University Press is the world's most respected academic publisher and they offered to publish this Southern Baptist's first major work. It was heady stuff! However, I was keen to return to the service of the churches in the Southern Baptist Convention. Within a few days, I was back in the United States and changed track to preach in the churches, to pursue a career in theological pedagogy, and to engage in academic administration. Moreover, I wanted to revise the dissertation somewhat in preparation for publication. Surprisingly, I also ran into an unexpected emotional block to revisiting a subject to which I had given so much of my life already. In the meantime, I continued to write and edit a number of essays, books, and volumes. However, through the patient counsel and personal encouragement of Maltby, MacCulloch, and of Paul Fiddes, Professor of Systematic Theology at Oxford and former Principal of Regent's Park College, as well as the encouragement of Craig Blaising, the Provost at Southwestern Seminary, I finished the revision. 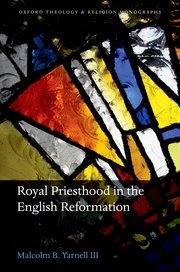 The revision was subsequently approved by the Theology and Religion Monographs committee at OUP and is now set to appear. Thank you for allowing me a minute of your time to honor people who have been so important in my academic life. My hope in writing this is that perhaps one of my students would also be encouraged to take the long road of academic studies in the trust that it may benefit both church and academy.